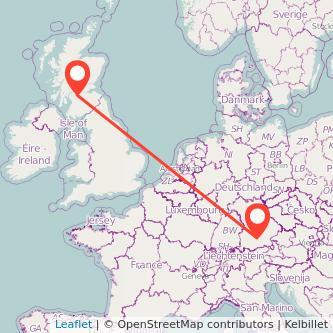 Search for your ticket on gopili to see the different companies for your train connecting Glasgow (South Western Scotland) to Munich (Germany). The services on board may change depending on the train operator. The duration to travel to Munich from Glasgow can vary depending if your train is direct or with changes. There are 856 miles between both cities. Depending how much time in advance you book your ticket as well as when you travel, the price of the ticket will vary. Find the cheapest tickets to travel from Glasgow to Munich by train, bus, ride sharing and plane. We compare train ticket for all major companies to travel between Glasgow and Munich by train and find the best prices for the coming days. Take a look at the prices of train tickets Munich to Glasgow and find the best deal for your outbound journey.